Basel (Switzerland) – May 28, 2018 (travelindex.com) – The longstanding Managing Director of Baselworld, Sylvie Ritter, has decided to step down from her position at the MCH Group. Michel Loris-Melikoff, who has until now held the position of Director of MCH Beaulieu Lausanne SA, will succeed her. Michel Loris-Melikoff is a 53-year-old lawyer who started his career in private banking, before switching to entering the event industry 20 years ago. 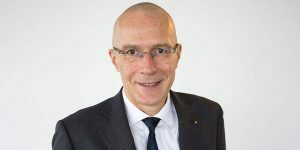 After six years as President of the Zurich Street Parade, he took over the management of an event agency that drew up and implemented concepts for national and international events staged by international sports associations, public entities and private companies. He then took over as Managing Director of the “St. Jakobshalle” in Basel, before joining the MCH Group. It is already clear that Baselworld 2019 will be open an entire day for the media representatives. The exhibition newspaper, “Baselworld Daily News”, will be coming back in printed form and with a new concept. In parallel, the digital information and communication offerings launched in 2018 will be intensified and supplemented by new services for exhibitors, visitors and the media.